Did you know that penguins spend about half their lives on land and half in the ocean? If you love the land and sea then penguins just might be your new favorite animal! Penguins. Who would have thought they’d be the hottest and trendiest animal since white Siberian tigers (what, you weren’t a fan of Siegfried and Roy?)? Even though most of us aren’t lucky enough to have penguins nearby (unless you live close to a zoo – or perhaps you are a researcher in the Arctic), there have been plenty of movies and shows recently that help us better understand the adorable little flightless birds. Whether you are into the cartoon versions or the documentary variety – penguins have nearly universal appeal for both kids and adults alike. This adult penguin costume is both hilarious and unique – a winning combination for any party, Halloween or otherwise. The 100% poly foam costume comes with a black tunic that has an attached hood and a red bow at the neck. The hood features large blue eyes and yellow beak – adding an adorable and irresistible accent to the costume. The wing sleeves have openings in the back so that you can enjoy an adult beverage or two (or maybe just to open doors and perform standard tasks, you know – the usual). Also included are yellow foam boot covers that secure in place with an elastic band around the ankle and a strap along the bottom. 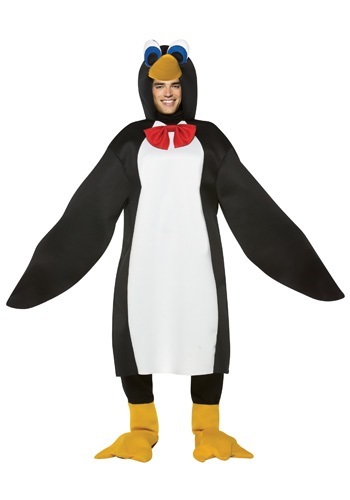 Show off your softer side this Halloween with this funny penguin costume. Received my costume in a very short time after ordering it. After trying it on,it fit perfectly,but I found one of the shoe covers was damaged. I called Halloween Costumes, explained the problem,and was told that a new set of covers would be shipped out immediately. Can't ask for better service. So i bought this costume for a college halloween party. Ended up walking outside of a house party to be greeted by two cops galloping towards me on huge horses. I ended up getting an open intox charge and had to stand there in the costume as they wrote me a ticket, while everyone laughed as they walked by. Costume was a hit at the parties though. Was this review helpful to you?YesNo0 people thought so and 3 didn't.